IPOB has told the Arewa Groups to give the Igbos time to relocate back to the south. Their leader, Nnamdi Kanu also thanked the northerners for giving the Igbos an advance warning to vacate the north. Recall, some Arewa youth groups had a three-month quit notice from the north to Igbos residing there. Kaduna State Governor, Nasir el-Rufai, and other northern Governors had kicked against the notice but some elders in the region have backed the eviction of Igbo from the north. The Northern Elders Forum (NEF) on Friday, June 9, threw its weight behind the call for Igbo to vacate the north. In a statement signed by Emma Powerful, IPOB called on all southerners in the north to start leaving the region as soon as possible. “We the members of the Indigenous People of Biafra (IPOB) and it’s leadership worldwide wish to sincerely thank the Arewa Elders Forum (AEF), Arewa Youths and Arewa Consultative Forum for seeing sense in what IPOB has been saying about the need for a referendum to be conducted in Nigeria to decide the fate of the component ethnic nationalities criminally lumped together by the British in 1914,” the statement read. “We promise to adhere to your warning to leave Northern Nigeria because a word is enough for the wise. Biafrans and other Southerner should start packing their properties to come down to the South. We also advice the Northern youths and their Elders to keep it on because all they have done is exercise their right to free speech which is not a crime under any law known to man. We are therefore against those calling for the arrest of these Arewa Youths and their Elders. 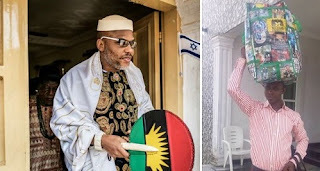 “IPOB under the divine leadership of Mazi Nnamdi Kanu is the instrument Chukwu Okike Abiama (God Almighty) is using to restore Biafra, therefore we are not afraid of our enemies, neither will any threat or violence from any quarter deter us. We remain peaceful in our noble quest to restore Biafra but we must caution that we always retain the right as a people to defend ourselves should the need arise. “The civilised world is aware that we IPOB have been adopting peaceful means to restore Biafra since 2014. It is the Arewa Islamic Northern Nigeria dominated Army, Police, Navy and Civil Defence that has brought torture, killings, massacres and mayhem to communities and populations in the South. Till date, nobody has been held to account despite the existence of a comprehensive Amnesty International report to this effect. Other northern stakeholders against the quit notice include, Sokoto governor Aminu Tambuwal and the Emir of Katsina Abdulmumini Kabir. They said that Igbo natives are free to reside in the region for as long they want.